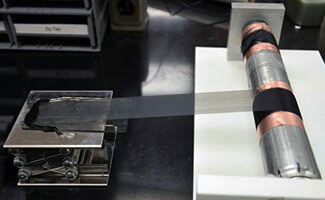 A sheet of aligned carbon nanotubes is rolled on a cylinder. Copyright Wiley-VCH Verlag GmbH & Co. KGaA. Using sheets of aligned carbon nanotubes coated with silicon, scientists at NC State have demonstrated a method for improving the design of rechargeable lithium ion batteries. Vertically grown aligned carbon nanotube (CNT) forests are drawn into aligned CNT sheets and coated with silicon. Copyright Wiley-VCH Verlag GmbH & Co. KGaA. Image: Wiley-VCH Verlag GmbH & Co. KGaA. Be the first to comment on "Aligned Carbon Nanotube-Silicon Sheets Improve Battery Design"